A research team form Northern University has decided to take their unmanned sub on a practice mission in Lake Tahoe. The remotely operated vehicle will undergo trials to collect data regarding the West Sore fault and seismic related activity. The data collected will provide insight into past seismic activity. At depths of up to1, 200 feet, the remotely operated vehicle (ROV) will survey the fault line that runs along the West Shore. The sub will travel 1,000 feet down to capture high-definition images of the earthquake fault. The sub is equipped with three video cameras, a laser measuring device, acoustic sounder for profiling the lake floor, and X-ray like imaging. After the systems of the ROV have been tested, the vehicle will be taken to Antarctica where researchers will examine the Ross Ice Shelf. 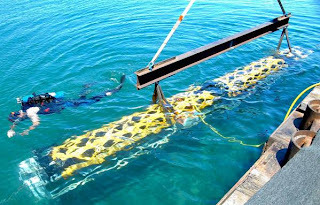 The ROV weighs 2,000 pounds, measures 22 inches in diameter and can travel to a depth of 3,000 meters. Global warming is a large component of the research in Antarctica.